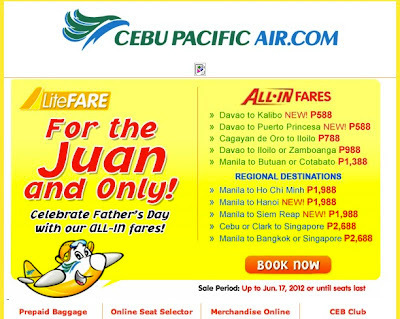 Cebu Pacific introduces their newest flights from Davao to Palawan and Boracay with P588 all-in seat sale! The Philippines’ largest national flag carrier, Cebu Pacific (PSE:CEB) strengthens Philippine tourism with its new direct flights from Davao to Puerto Princesa in Palawan, and Kalibo, gateway to Boracay starting August 1, 2012. Both Davao-Kalibo and Davao-Puerto Princesa routes will be on a four times weekly schedule, operating every Tuesday, Thursday, Saturday and Sunday. “We are proud to offer even more connectivity to and from Davao, a region with a lot of potential for tourism. Now, tourists can proceed to Davao from Palawan or Boracay. More residents from Davao and neighboring areas can take direct flights to two of the Philippines’ most popular beach and diving destinations,” said CEB VP for Marketing and Distribution Candice Iyog. To launch these new routes, CEB offers a P588 all-in seat sale from Davao to Puerto Princesa and Kalibo or vice versa. This is for sale from June 13 to 15, 2012 or until seats last, for travel from August 1 to October 31, 2012. After the seat sale, passengers may book the lowest year-round all-in fares of P1,964 from Davao to Kalibo, and P2,244 from Davao to Puerto Princesa. All-in domestic fares are inclusive of fuel surcharge, administration fee, aviation security fee, 12% VAT and 7 kilos hand carry baggage allowance, but exclusive of check-in baggage. “CEB remains committed in providing the most extensive route network in the Philippines, so more passengers can book CEB’s trademark low fares on direct flights. This will translate to savings as much as 55% as compared to booking connecting flights,” Iyog added. The largest airline operating in Davao, CEB posted 47% market share in Davao in 2011, where it operates more than 200 weekly flights. With these new destinations, CEB continues to offer the most number of flights to and from Davao. It also operates up to 8 daily flights to Manila, 4 daily flights to Cebu, daily flights to both Zamboanga and Davao, and 4 weekly flights to Cagayan de Oro. CEB currently operates 10 Airbus A319, 20 Airbus A320 and 8 ATR-72 500 aircraft. Its fleet of 38 aircraft – with an average age of 3.6 years – is the largest aircraft fleet in the Philippines. Between 2012 and 2021, Cebu Pacific will take delivery of 22 more Airbus A320 and 30 Airbus A321neo aircraft orders. It is slated to begin long-haul services in the 3rd quarter of 2013. In its 16th year of operations, CEB had flown over 60 million passengers. It provides access to the most extensive network in the Philppines, with 32 domestic and 19 international destinations. The airline also remains a pioneer in the Philippine aviation industry by being the first to offer web check-in, self check-in, e-ticketing, and Lite Fares. Travel to KOREA with 50% Off! Promo Fares For China and Hong Kong!